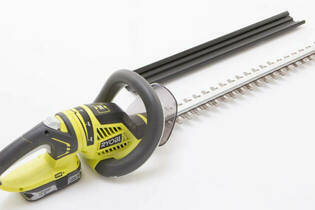 Snapshot: The Ryobi OHT1851R is a battery hedge trimmer with a 50cm blade. But is it a cut above the rest? Hedge-trimming visibility is very good. Short run time of 26 minutes with cheapest ($80) 1.3Ah battery. Run-time will be significantly longer with 2.5Ah ($109) or 5.0Ah battery ($169). 06 Jan 2018, Scott M.
* Definitely needs a decent-sized battery - the 4.0Ah lasts roughly 60-90 minutes depending on the hedge type. 24 Jun 2017, Bryce H.